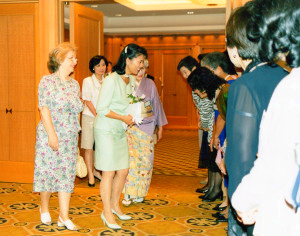 On June 1st 1998, under the President Mrs. Jill Sinclair-Ito, the 90th Anniversary Luncheon was honored with the presence on H.I.H. Princess Takamado. Donations were made to many charities. 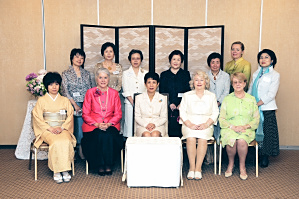 On June 2nd 2008, under the President Mrs. Brigitte Sekine, the 100th Anniversary was celebrated with a luncheon at the Imperial Hotel, honored by the presence of H.I.H. Princess Takamado. A donation of 1,000,000 yen was shared between different organizations such as Marie Stopes Clinic in UK, World Food Program, Red Cross China and Red Cross Myanmar. An embroidered handkerchief was offered to the audience as a souvenir of the day. 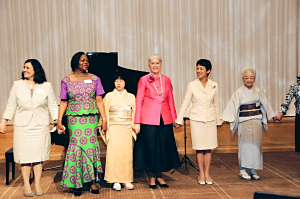 On June 3rd 2013, the 105th Anniversary Luncheon was held at the Capitol Hotel Tokyu. Read more here.